It was a case of so far, so good for Hearts as their pre-season preparations for a return to the Ladbrokes Premiership continued with a 2-0 win over Raith Rovers at Stark’s Park last night. Goals from Gary Oliver and Jamie Walker, coupled with a clean sheet, will no doubt have pleased head coach Robbie Neilson. Perhaps more importantly, his entire match squad were given a decent run out and came through unscathed in front of 1983 spectators. Alim Ozturk was still feeling the effects of the thigh injury that forced him off after just 26 minutes of the Jambos 4-2 win over Shelbourne at the weekend. He made way for Liam Smith, back from a season-long loan at East Fife, while 17-year-old Sean McKirdy lined up for this third top team start alongside Kenny Anderson in midfield. Under-17s coach Liam Fox – still registered as a player – was given a spot on the bench at his old stomping ground, having left Starks in the summer to take up the post at Riccarton. Spanish striker Juanma, fresh from netting his first goal for club in Dublin last weekend against Shelbourne, went close to another within five minutes. A clever nutmeg from El Hassnaoui on Rory McKeown got the Dutch-Moroccan in behind the home defence before picking out his strike partner, but the recent arrival from Kalloni failed to make proper contact. The Premiership team dominated possession in the opening stages and were certainly testing Raith’s legs as they tried to close down. This was the Kirkcaldy club’s maiden fixture under new boss Ray MacKinnon after the weekend’s scheduled fixture against Brechin was postponed. The diminutive McKirdy was certainly combative, and provided an example of his confidence when he sent a clever left footed chip not too far wide of Kevin Cuthbert’s top corner from the edge of the area. Gary Oliver then went even closer, his attempt a mirror image of McKirdy’s that cracked off the outside of Cuthbert’s left-hand post. Rovers’ first real attempt at troubling Neil Alexander came ten minutes before the interval. Lewis Vaughan’s in-swinging delivery flashed across the six yard area and was missed by all in the maroon shirt before Grant Anderson returned the favour and failed to connect at the back post. Until that point, the Hearts keeper had been occupying himself by playing as an auxiliary sweeper behind Jordan McGhee and Blazej Augustyn, who kept the captain’s armband in Ozturk’s absence. 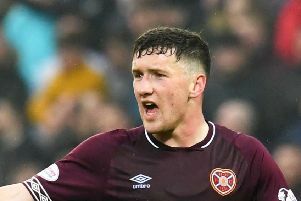 Neilson discontinued the policy adopted in Hearts’ previous two friendlies of wholesale half-time changes as an unchanged line-up emerged after the interval. That same eleven almost produced the opener within a minute of the restart after Oliver fed the overlapping Callum Paterson on the right, and the Scotland U-21 international saw his low delivery inadvertently turned against his own cross bar by Kyle Benedictus. The visitors were having some joy probing down the right, and Oliver again was creator as he fed El Hassnaoui from the angle of the box, whose powerful near-post drive was smothered by Cuthburt. Nicholson was next to try his luck as Neilson’s side began to find pockets of space in their opponents’ half, but his low trundler lacked the power and accuracy to call Cuthbert into action. The breakthrough, unsurprisingly, came for Hearts on 55 minutes. Oliver, who had drifted infield from his wide right berth, picked up possession 20 yards and hit a speculative effort. Benedictus threw himself in front of the ball, but the luck he had enjoyed minutes earlier deserted him and it looped over Cuthbert for Oliver’s second goal in three pre-season outings. Both teams made a raft of changes on the hour mark. Neilson changed his entire team bar Alexander and Liam Smith, handing first team debuts to defender Leon Jones and striker Russell McLean in the process. Liam Fox was also given a run out, 11 years after first leaving the club. Such an upheaval in personnel threatened to disrupt Hearts’ and indeed the game’s rhythm, and it looked to be petering out to a scrappy end until a moment of quality from Jamie Walker. The attacker didn’t even need to look up as hit stepped on to McLean’s knockdown and curled a wonderful first time effort over the helpless Cuthbert. Hearts pre 60 mins: Alexander, Paterson, Augustyn, McGhee, L Smith, Oliver, McKirdy, Anderson, Nicholson, El Hassnaoui, Juanma. Hearts post 60 mins: Alexander, Fox, Jones, Howlett-Mundle, L Smith, Walker, Pallardo, King, Reilly, Sow, Russell.